New England just had its warmest winter ever recorded, according to the National Oceanic and Atmospheric Administration (NOAA). 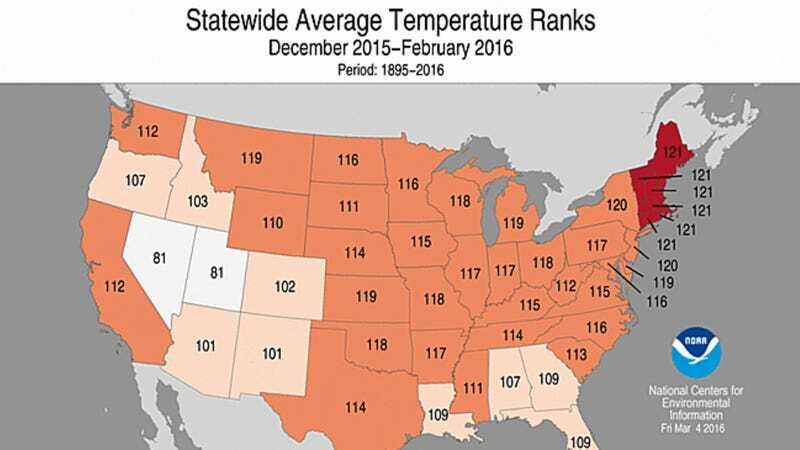 The contiguous U.S. also saw the warmest average temperatures ever recorded from December 2015 through February 2016. 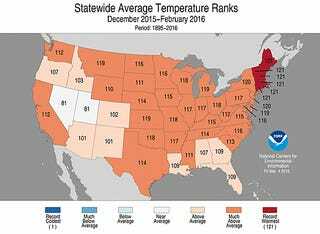 Every state had above-average temperatures, 36 states had a top-ten warmest winter, and six states in the Northeast—Maine, Vermont, New Hampshire, Massachusetts, Connecticut, and Rhode Island, each had all-time record-warm winters. Here's the map; the numbers represent the x-number winter recorded this year, counting up to the top, 121. "The record warmth is due to the steady accumulation of heat-trapping gases in Earth's atmosphere due to human activities, plus an extra approximately 10% bump in temperatures due to the slowly waning record-strength El Niño event in the Eastern Pacific," meteorologist Jeff Masters wrote on the Weather Underground blog. He said we can expect NOAA to announce that Earth set a new record for warmest winter when results are released later this month; December 2015 and January 2016 were the two warmest months in recorded history (expressed as a departure from average).